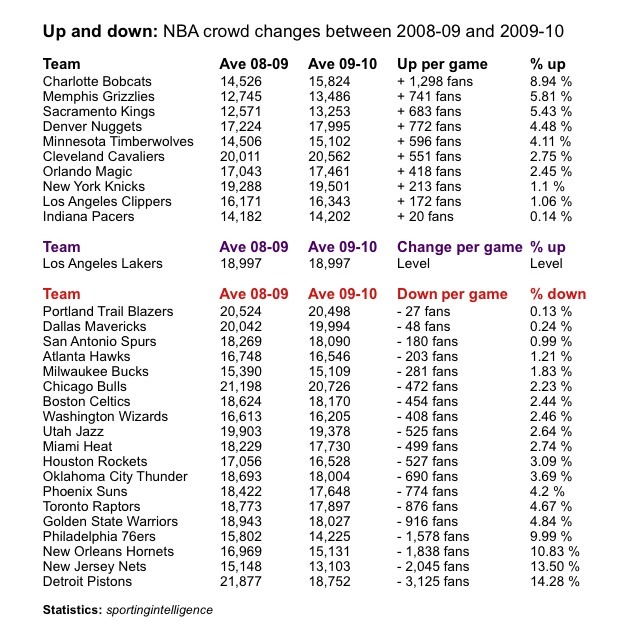 The NBA’s regular-season crowds for the 2009-10 season have echoed those in the NHL and NFL by dipping year-on-year, but only slightly according to a new analysis of attendances by sportingintelligence that highlights some intriguing individual “ups” and “downs” in numbers. After number-crunching official data, we have calculated that 21,094,015 paying fans watched the 1,230 games in the NBA’s 2009-10 regular season, which equates to 17,150 fans per game. The regular season finished last week and the play-offs are in progress. The 2009-10 gates represent a fall of 455,223 fans overall, or 2.11 per cent, on 2008-09’s numbers of 21,549,238 fans (17,520 per game). Yet like the NHL, things could have been much worse if we’d believed the “barometer” of attendance at the back end of 2009. As Ken Berger of CBS Sports detailed in a blog in early December, paid attendances at NBA games were down 3.7 per cent at that stage, with revenues down 7.4 per cent. But like the NHL, a rally in crowds has kept the dip minimal. Our report yesterday on NHL crowds is linked here. Our table below of crowd movements – year-on-year and team-by-team – highlights how different teams have coped with the economic situation. Ten teams actually registered rises in crowds, with the Charlotte Bobcats having the biggest actual and relative surge (up 1,298 fans per game, or 8.94 per cent), while the Grizzlies, Kings, Nuggets, Timberwolves, Cavaliers, Magic, Knicks, Clippers and Pacers also saw rises. The Lakers were dead level on 18,997 fans per game, again. That means 19 teams saw falls in crowds, although 15 of those 19 saw falls of less than five per cent, and 10 of those 15 saw falls of less than three per cent. The heaviest losers were, perhaps predictably, in poorer areas where the recession has bitten hardest. The Detroit Pistons lost more than 3,000 fans per game to register a fall of 14.28 per cent in crowds, while numbers were down at the Jets (13.50 per cent, or 2.045 fans per game), the Hornets and the 76ers. Having said that, the Pistons remain one of just five teams with average crowds higher than 20,000 fans per game. The Bulls, Mavericks and Blazers do too, despite year-on-year falls. The Cavaliers remain in the 20,000-plus bracket having gained 551 fans per game. The comparison between the Bulls and the Cavaliers is particularly appropriate today because that pair are locked in their play-off series with the Cavaliers 2-0 up at the time of writing (on the morning on Wednesday 21 April). The Bulls numbers fell this regular season to 20,726 fans per game while the Cavaliers’ numbers rose to 20,562 fans per game. If one were to try to predict the play-off results simply and solely on the relative rises and falls of crowds this season, you’d expect: the Cavaliers to beat the Bulls; the Celtics to beat the Heat; the Hawks to beat the Bucks, just; the Bobcats to beat the Magic; the Lakers to beat the Thunder; the Nuggets to beat the Jazz; the Trail Blazers to beat the Suns; and the Mavericks to beat the Spurs, just. As sportingintelligence reveals in our inaugural Annual Review of Global Sports Salaries (ARGSS), published earlier this month, the NBA is the richest sports league in the world in terms of average salary per player, by weekly wage. Crowds, and revenues, remain strong. The ARGSS found the top five leagues by average pay per player per week were, in order, the NBA (basketball), the IPL (cricket), MLB (baseball), English Premier League (football / soccer) and the NHL, ahead of the NFL in sixth place. Full details, team-by-team breakdowns and pay-versus-performance analysis can be found in the full report, as can a table of attendance data for major domestic sports leagues around the world. A regularly update version of that table can be found in the ‘Finance and Biz’ section of this site, in the ‘Business Intelligence’ sub-section. Next article Q: How much does Britain's next Minister for Sport really care about sport?